Our aim is to empower parents by teaching them to progress at the child’s pace using verbal cues, body language, and positive feedback. Our swimming and aquatic instructors at Aim Above guide parents in introducing their child to water skills using water toys, games and interactive songs. 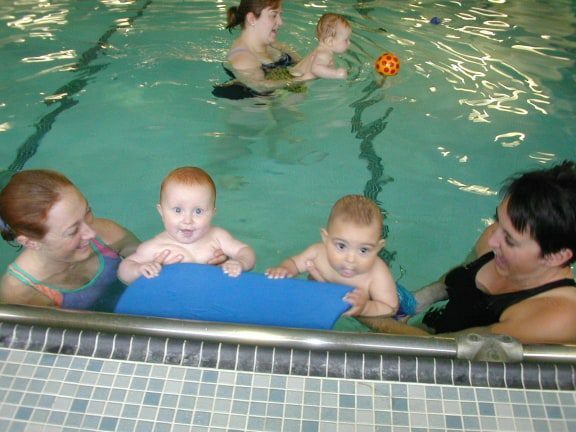 We teach basic swimming skills and aquatics to children and toddlers in the Toronto area in our Parent & Tot program. This parented class is designed to help parents introduce their tot to the aquatic environment. 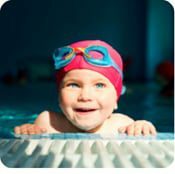 Swimming lessons for toddlers aim mainly to increase their comfort level in the water. While they may learn some basic water skills, Aim Above Market Research shows that children under age 4 are not developmentally ready for formal swimming instruction. Incorporating games into toddler swimming lessons makes the kids more at ease in the water and teaches them water basics they can use in later swimming lessons. An Aim Above swimming instructor is in the water to teach and show you how to help you child accomplish a variety of skills such as confidence in the water, blowing bubbles, going under water, kicking and floating. We also follow the Red Cross and Lifesaving Society guidelines for proper form and technique for floating, swimming and kicking for toddlers. The beauty of private 1-on-1 and semi-private lessons in the Toronto area with your child is that you get personalized and individual feedback and bond with your son/daughter and most importantly have fun! A splashing competition encourages toddlers to kick their feet and move their hands in the water. These movements help prepare toddlers for swimming techniques they will need when they get older. They become more comfortable in the water and learn how to move around. 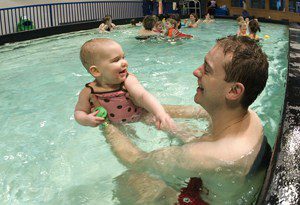 Our Aim Above swimming instructors will show you different methods and how to hold your child on his front or back as he kicks his legs as fast and hard as he/she can. Another option is to have the toddler hold onto a floating pool noodle or the edge of the pool as they kick. The splashing competition will determine who can make the biggest splash or keep splashing for the longest amount of time. Floating bath toys work well in the pool during toddler swimming lessons. They provide an appealing target for the toddlers to reach for as they play in the water. For example, our Aim Above swim instructor would toss a toy 10 to 15 feet away from the toddler, encouraging him/her to reach for it with her arms extended. You would hold her on your child’s tummy as they reach for the toy. This activity gets the child’s body and arms into a position similar to one he/she would use for actual swimming. As the toddlers progress, we show you how to encourage them to add a kick or to alternate the hand they use to reach with. Childhood songs and nursery rhymes encourage toddlers to play and explore the water with familiar actions. “Ring Around the Rosie” is one example of a song that works well in the pool. Singing is a bonding experience with your child. As you hold your toddler, our aquatics instructors show you actions and particular key words to emphasize while singing the song and turn in a circle in the pool followed by blowing bubbles under the water. Instead of falling down at the end, we would slowly submerge the toddler under the water slightly and lower down to about neck deep. We avoid dunking your toddler, as he/she may swallow water or become scared. “Humpty Dumpty” is also an option for swimming lessons plus many more fun and interactive songs. Aim Above sings these songs with enthusiasm so your kids will want us to sing more of these songs each and every time. With the toddlers on the edge of the pool, we sing the songs and lift them into the pool and twirl the toddler around when Humpty Dumpty falls off in the song. The kids love it! Blowing bubbles encourages the toddler to place her face in the water while teaching her to blow out so he/she doesn’t inhale or swallow the water. At Aim Above, we encourage the toddlers to see how many bubbles they can blow in the water. To help with the bubble blowing, we show you as a parent/caregiver to hold a bubble wand just under the water or hold a finger near the child in the water to represent a birthday candle. These familiar situations demonstrate how the toddlers should blow out to make bubbles. Space is limited for this program, so feel free to tell your friends/family members and colleagues and see if you would like to have lessons together at a pool near you. Click here to register today or contact us!